David Davis has hit out at the EU over its decision to exclude the UK from the Galileo satellite navigation system. The Brexit secretary accused the European Commission of “shooting itself in the foot just to prove that the gun works”. He said throwing the UK out of Galileo would delay it by three years and cost the EU £1bn more. The UK has played a major role in developing satellites for Galileo, an alternative to the US GPS system. The move has sparked a furious reaction from the UK government, which is demanding £1bn back from the EU and has threatened to build a rival satellite system, at an estimated cost of £5bn. 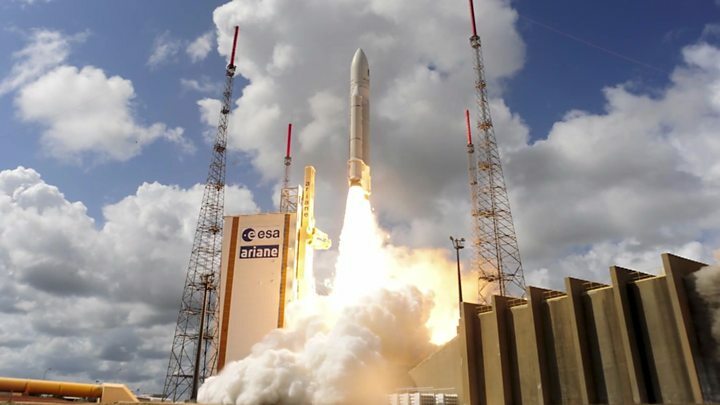 He said British companies were being discriminated against and blocked from contracts – despite the fact that excluding the UK would delay Galileo by three years or more. “This is not an issue isolated to Galileo,” he added. The UK had originally opposed the creation of the European Defence Fund, which co-ordinates joint operations by member states. The government wants to continue contributing troops, equipment and money to overseas EU military operations after Brexit. But Mr Davis said the EU’s attitude to “third countries” – which the UK will become after Brexit – was standing in the way of that ambition. “All of these unhelpful precedents and assumptions on how third countries should operate with the EU is hindering projects that would help the entire continent,” he said in his speech. The UK had also opposed the creation of Galileo, when it was first proposed 18 years ago, but Britain’s space industry had been a major player in the project, which is meant to be fully operational by 2026. It comes as the European Commission announced plans to pump an extra €5bn (£4.4bn) into space projects, including Galileo and the Copernicus Earth Observation Programme, which will be delivered in partnership with the European Space Agency. Britain will remain a member of the European Space Agency, which is not an EU body, after Brexit, and is willing to pay a fee of around £1bn to the European Commission to remain part of its space plans. But the Commission’s spending proposals on are based on the assumption that it will get no more cash from the UK after Brexit.